What: Over 20 brands of bikes to demo on 100 miles of singletrack. Beer Mile. Bike Rodeo. Strava Segment Races. Yoga. Bonfire Block Party. Where: In the center of Eagle, CO surrounded by trails on all sides. .5 miles from the nearest trailhead where you have access to 100+ miles of some of the best mountain bike trails in the state. If you haven’t ridden Eagle yet, read why Bicycling Magazine picked Eagle as one of the Top 6 Secret Mountain Bike destinations in the US. Launched over 10 years ago, the Eagle Outside Festival was created to showcase Eagle’s great weather, incredible quality of life, and its sprawling trail network. The trails are the star of the show at our event. 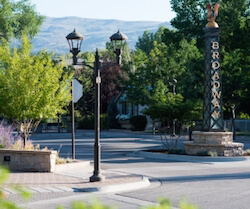 Spanning three different climate zones (from high desert to high alpine and everything in between,) they’re also accessible from just about anywhere in town. The centerpiece of our festival is the consumer demo, where you can pick up a bike from over 20 bike brands and take them for a spin on over 100 miles of singletrack. No shuttle needed. The closest trail head is 0.5 miles from the demo. As an extra bonus, attendees can enjoy The Bonfire Block Party, a downtown throw down of a street party with national touring musicians, great craft beer and more in a unique downtown venue. There’s a little something for everyone here in Eagle the weekend of May 31-June 2, so think about heading our way for your riding, racing and music-loving fix! Times and activities are subject to change. 3:00 pm – RippinChix Skills Clinic – RippinChix will be hosting clinics throughout the weekend. Check out the schedule, themes, etc. here. These camps sell out so register early. 4pm-11pm – Bonfire Block Party – Broadway St. – Get all the info about the blockparty and buy tickets at www.bonfireblockparty.com. 8:00 am – RippinChix Singletrack Clinic – RippinChix will be hosting clinics throughout the weekend. Check out the schedule, themes, etc. here. These camps sell out so register early. 9:00 am – RippinChix Skills Clinic – RippinChix will be hosting clinics throughout the weekend. Check out the schedule, themes, etc. here. These camps sell out so register early. 9:30 am – YOGA+BEATS – Beats and Bloodies – Get your tickets here. 10:00 am – The Cycle Effect Group Ride – Join the Cycle Effect for a beginner to intermediate MTB group ride. Meet at the Cycle Effect Tent on Capitol St.
1:00 pm – RippinChix Skills Clinic – RippinChix will be hosting clinics throughout the weekend. Check out the schedule, themes, etc. here. These camps sell out so register early. 2:00pm – CHROMOLY CHEF – Capitol St. – Teams of 2 have 1 hour to build a frankenbike to race using scrap and recycled parts. Check out this video for some inspiration. The best bike and outdoor brands in the US all converge on Eagle each year for the Eagle Outside Festival’s kiggass bike and gear demo. The demo attracts the best brands in the world and allows eager riders itching to pull the trigger on a new ride the change to throw a leg over their top choices. Want to ride lots of bike for 2 days while supporting trails? Demo access for the whole weekend is $10 and 100% of the event proceeds go to trail projects. You can’t even demo a single bike from a shop for $10 let along dozens of bikes from dozens of brands. With countless options for 60-minute mini-epics within rock chucking distance from the event venue, there’s enough time to ride them all! Don’t know where you’re going? We’ll give you a map! See below who is coming so far. We will add more vendors here as they confirm. Check back often or like the Eagle Outside Festival on Facebook for updates of brands. Want to bring your brand? Click here for the vendor registration page to grab more info on pricing, load-in information, included amenities and discounts! Check out new bikes and new trails at the Eagle Outside Festival. Go out and ride, log your ride on strava, and win! When you check in at the Eagle Outside Festival Demo, check out the list of daily segments and go ride. Stop back by the Dusty Boot at 3:00 pm and we will hand out prizes for the riders at the top of the leader board. Don’t be a jerk. Your time is not worth injuring someone else. If you are reported as being disrespectful on the trails you will be ineligible for prizes and publicly shamed. That being said, please report extra awesome behavior because we will have some prizes for that as well! We will release the list of segments each morning of the demo. There will be some uphill segments, downhill segments, etc. 4 laps, 4 deliciously cold draughts of 7 Hermits Beer or 4 similarly bubbly non-alcoholic facsimiles for the teetotalers (that means non-drinkers). Which of the 7 Hermits Brews will you be drinking? Spin the wheel and find out! Oh, you don’t have a sense of adventure? $20 to race and let the wheel decide your future. Pay $5 extra and get to pick your flavor. Winners receive a $100 Gift Card to 7 Hermits, some sweet swag and 12-pack of glory, individually packaged in eco-friendly and 100% recyclable 12oz containers. Which will be sweet. And which will TRUMPET your awesomeness from now until the day you shuffle off your mortal coil. Or until you lose it. Or until the day when one of your pals (in a fit of envy-fueled pique & pettiness) steals it from you. Then the awesome transfers to them (with a bit of a karmic ding). The beer category is open to runners, ball’rs and bon vivants 21 years or older. Solo and 2-person team categories available. Not 21? Don’t like beer? We’ll have fizzy non-alcoholic drinks on hand for non-drinkers. If you’re 18 or under, sign up for the Milk (& Cookies!) Run. Howzat work? What’s the Milk and Cookies Run, you ask? Great question! It’s a race for kids 18 and under and broken into teams of 2 or 4. After each lap the runners need to consume one glass of milk (chocolate or regular) and one chocolate chip cookie. Registration will be onsite at 7 Hermits Brewery on Saturday June 1st.